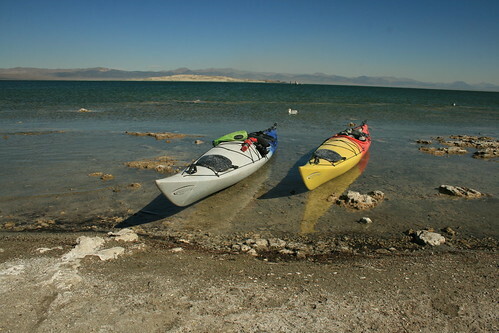 The baja carried our two kayaks over the mountains to Mono Lake. 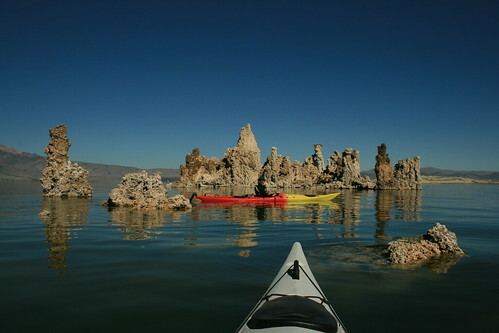 I don't remember now what first gave me the idea to go kayaking on Mono Lake. But once it got into my head, I was determined to do it. Actually, I think it had something to do with hot springs (like all the crazy adventures, it seems). Somewhere I read that there was a hot spring on the big island (called Pahoa Island) on Mono Lake and the only way to reach it was by boat. The idea of visiting such a remote hot spring, which is three miles from the nearest launching point, made me want to go see it. I guess it was a similar motivation as the one I had to hike to Iva Bell, which was 13 miles from the nearest trail head. I then confirmed that it existed when I found a NOAA report from the 70s of all the hot springs in the US, complete with the GPS coordinates, water temperatures, and common name. From there I learned that the spring was so hot it was just 10 degrees short of boiling, and it was alkali. Not to great for bathing, but I wanted to see it anyways. 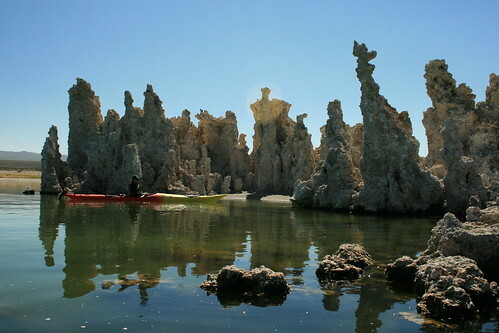 Kayaking through/around the South Tufa formation. 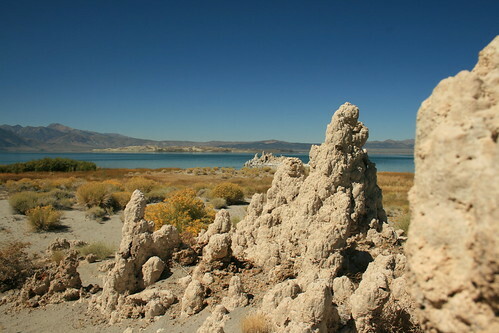 Mono Lake is a small inland sea, but it is 3 times saltier than the ocean! Its so salty, that nothing really lives in it except tiny brine shrimp. It is actually one of the oldest lakes in America, so it has been accumulating salt for a long long time! The area is full of recent volcanic activity, the most spectacular being the formation of the islands on the lake. They weren't there 400 years ago! They erupted just 'yesterday' if you think about the area on a geological time scale. The numerous hot springs on the island, which gush forth fresh water, are what create the famous tufa formations that ring the shore. 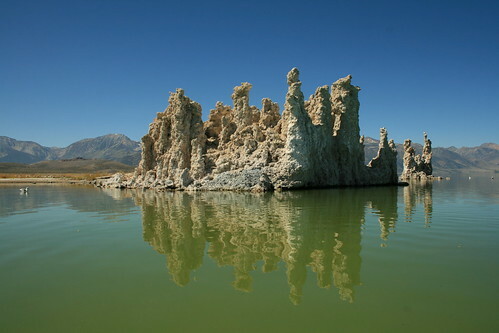 Each tufa was once an active spring and formed from the interaction between calcium that was dissolved in the spring water with carbonates in the lake water. Over time, the calcium carbonate built up into tall towers. These have a sort of eerie beauty to them. Posing for a picture by the South Tufa formation. Our trip started on Friday afternoon. We packed up the baja, filling it with dry bags with all of our camping equipment and food inside. Then we loaded the two kayaks onto the roof rack and tied them down. We had a long journey ahead of us, so we double checked that they were secure. 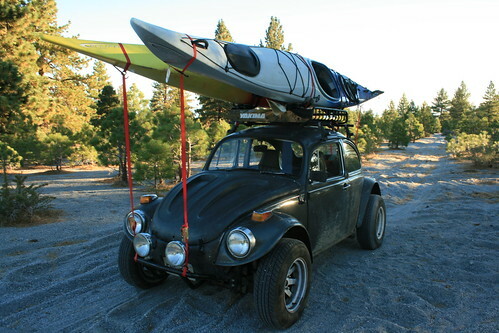 There is something funny about the tiny VW Beetle carrying two huge sea kayaks. The kayaks are longer than the baja and overhang the front and rear bumper by almost a foot! We always get a lot of looks and laughs as we drive by. Two lone Tufa far off shore. Mono Lake is located on the eastern side of the Sierra Nevada mountains, where the high peaks drop sharply in elevation to the valley below. In the summer, strong winds develop in the afternoon that rip over the mountains and crash down into the valley. I think they are temperature/density driven. 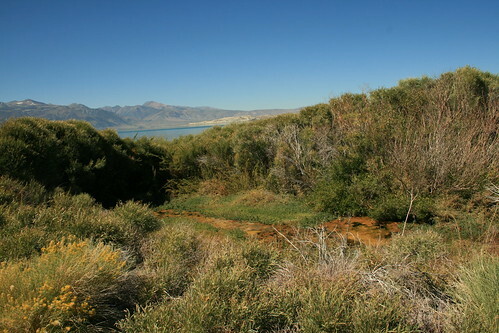 Winds over Mono Lake can reach hurricane force on a typical summer afternoon. All over the lake, there are signs posted warning of these sudden winds, and many people have died because they drowned or something when the winds picked up on the water. So it is recommended that you kayak only in the morning, and make sure you get to shore by noon or 1pm. 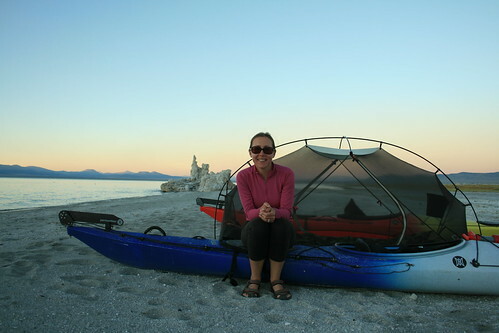 In order to have enough time to kayak to the island and make it there before noon on Saturday, we drove over the mountains on Friday night and camped near Navy Beach in the mono craters forested area over night. The next morning we went to the visitor center as soon as they opened (8am) to pick up our camping permits. Paddling into the protected little cove inside Castle Tufa. "I don't recommend going out on the water and paddling to the island because on the way back Sunday there are 30 mile an hour winds forecasted for all day." Damn. I was kind of pissed actually, because we hauled those things all the way here, and now we were thwarted by the wind! The prevailing wind direction was towards the island from Navy Beach, so getting there would be a breeze (haha, pun intended!) but paddling on the way back would be rather difficult and dangerous on Sunday. Finally then we asked him what he recommended that we do. He probably sensed that we were kind of disappointed, so he kept repeating that we could go if we wanted to, but he also kept stressing the dangers of it, and how many people had died on the lake due to the sudden strong winds (about a few people each year). I had no doubt about the danger, so I asked if it was okay to kayak along the south shore instead and camp overnight somewhere. 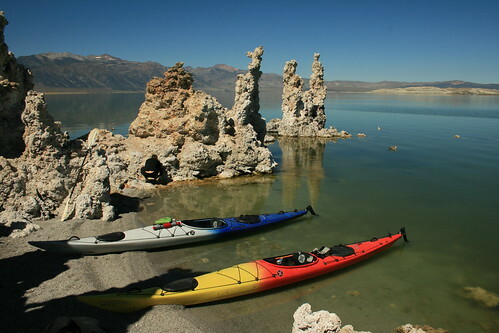 He said that that was an excellent alternative, and then told us about all of the tufa towers and fresh springs along the shore we could check out. He also let us know where we were allowed to camp (anywhere except near the freshwater springs). Taking a break at Castle Tufa. So although we weren't headed to the big island, we at least had a safe alternative, so we got back in the baja and took the kayaks to Navy Beach so that we could launch as quickly as possible before the afternoon winds picked up. Since all we had to do was stuff all of our stuff into the boats, we were ready within 1/2 an hour. Our first stop was the South Tufa formation which was very near Navy Beach. Its a really large formation and sees a lot of tourists (from the land). But it looks a lot different from the water! The Castle Tufa reflects off the glassy water of Mono Lake. That morning the water was calm, and like glass. It reflected all of the tufa formations like a mirror. The only disturbance was when we paddled by. 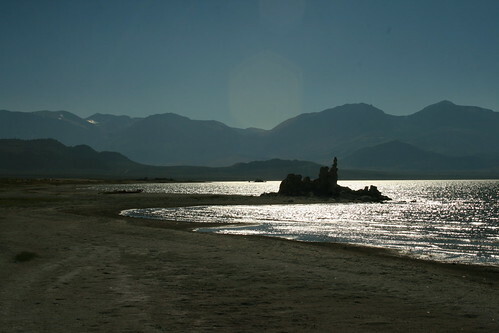 Near the South Tufa, but farther off shore, were two lone towers standing like pinnacles. We kayaked out to them and checked it out, and then started heading east along the southern shore of the lake. All surrounding the lake was sandy soil with lots of rubber rabbit bush in bright yellow bloom. They are my favorite desert plant because of their bright fall color. 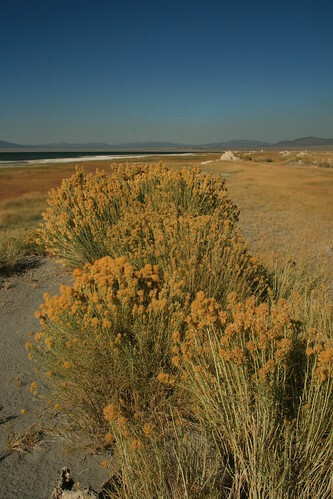 Blooming rubber rabbit bush on the shores on Lake Mono. Soon we reached the Castle Tufa which was about 2 miles away from where we launched that morning. It stood like a fortress on the shore. But only when we got closer did we realize why it was really called Castle Tufa. 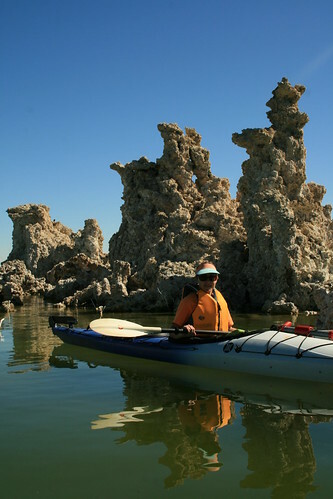 As we paddled around it, we realized that there was a small protected cove inside the tufa formation. We carefully paddled inside and discovered multiply flowing fresh water cold springs coming out of some of the tufas! We washed our arms and legs in the fresh water, which by now were caked in salt crust from the splashes of salt water as we kayaked. What a relief! The salt was starting to burn my skin a little and made it feel dried and leathery. It also left a faint smell, very organic, slightly rotten and salty. Simon Springs on the southern shore of Mono Lake. After a break, we paddled on, staying close to the shore. The water near the surface was filled with tiny brine shrimp. We took a good look at them and realized they were in almost all colors of the rainbow. Some were pink, creamy colored, and others were bright iridescent turquoise! They swam (but mostly just floated) around with what looked like a million legs to each side and a long skinny tail. I wonder what eats them? It looked like birds picked at the water every once in a while, but not that much. Exposed land tufa that was once under water when the lake level was higher. Before we knew it, we reached Simon Springs, where we were supposed to camp for the night (well, not right at the springs because that isn't allowed). We got there earlier than expected, so we decided to go take a look at the marshy land that was surrounded by otherwise dry sandy desert. Reeds and cat-tail like plants grew all around, and there was an explosion of green. The spring area also had a few land tufa. Of course, these were formed when the lake water level was higher, and the tufa were submerged. The lake level has dropped nearly 40 feet since LA started diverting water for the city. 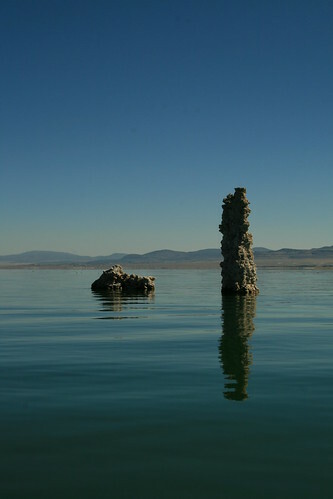 Now its gone back up 10 feet since conservation efforts won some important battles for Mono Lake. But the state of California has come to an agreement that LA only needs to manage how much water they take so the lake level returns another 10 feet higher. That leaves the lake 20 feet lower than it would naturally be. The reason for this (we learned from the rangers) is that the state of California wants to leave some of the tufa exposed because it has become a large tourist attraction! Kinda screwed up, in my opinion, but in a weird way it makes sense. I would rather see it go back to how it naturally was, but then again, we were there partly to see the tufa, after all, like most people. Beached at our camping spot for the night. It was already noon, but the winds were still calm. We decided to keep paddling farther down the shore to find a good camping spot. But like clockwork, about 20 minutes after we set off the first breezes blew by. Soon the breezes turned into gusts, rippling the surface of the water. The wind was coming from the west, from the mountains, and it pushed us from behind. We stopped paddling because the wind was becoming so strong enough that we literally didn't have to anymore. We saw white caps in the distance off shore between us and the big island, and the waves grew larger and larger where we were too. And then the wind was gusting so strongly, I started to get scared. The wind was catching on our paddles and rocking the kayaks back and forth. Just as the worst of it was beginning, we were blown towards a large sandy beach. We decided that it was a good spot to camp and beached our kayaks then and there. The rangers were not kidding about the winds being strong and sudden. One minute it was calm, and literally the next minute, we were being blown over! The view at our camp spot with the 'sheltory' tufa; the lake shining in the late afternoon sun. It really couldn't of been a better spot to camp actually, which was lucky. But the wind was blowing so much that we looked for a place to shelter from it. Again, lucky us, the wind took us to the beach that had a broad tufa formation which, when we sat behind it, blocked about 90% of all the wind! We relaxed there for a while, munching on some trail mix of hazelnuts, brazil nuts, and chocolate chunks. After a nice break, we walked around the shoreline to check out the many exposed land tufa in the area. The wind stayed pretty strong for a couple of hours, but as the sun began to sink lower towards the west, getting closer to setting behind the mountains, the wind calmed down. Finally near sunset, it got calm enough to build our tent (which at first we had to weigh down with the gallons of fresh water we brought with, or it would of blown away). Romy jumping with a bottle of wine! 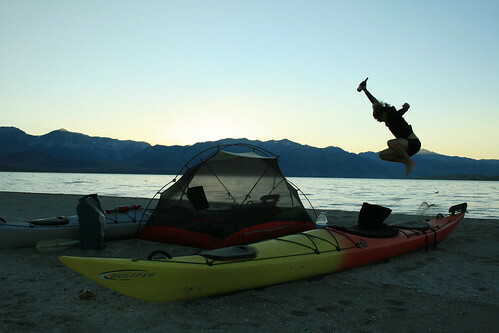 Camping with the kayaks was a sort of luxury. We had room to bring a lot of stuff and we weren't limited by weight! So we brought a bottle of wine for the evening. We also brought canned food and fruit (things we would never bring backpacking). And we had a lot of extra warm cloths. Good thing, because it was nice to change out of our salty cloths we paddled in and put on some comfy sweaters and sweatpants at night. During the day it was in the 70s, but after the sun set, it dipped into the 50s. Later in the night it got even colder, but stayed above freezing. The weather report at the ranger station said it was about 37 degrees, which was probably right before dawn. The skies were clear all night, and we had a bright moon that lit up the sky. For most of the night, there was a constant breeze. I hoped that it would stop by sunrise. When we woke up just after sunrise about 7am, the wind picked up. We knew it was going to be breezy today, but I hoped that it would give us a little break. Not a chance. The wind had changed direction, blowing off shore and slightly in the direction against where we needed to paddle back to Navy Beach, 6 miles away. Well, once we realized this we picked up the pace and got ready to start paddling back as soon as we could before the wind got worse. Soon we were launching the kayaks again onto the choppy lake. Me at our camp spot with the sheltory tufa behind. At first, we just started paddling along the shore parallel to it. But that wasn't working very well because the wind was blowing us slowly off shore and into the deeper water. It was doing it gradually enough that you couldn't notice, but once you did it was scary how far we were when we realized it. So we had to change our strategy and always paddle half way towards the shore and half way parallel to it. That way we were partially going towards our destination, and fighting the wind from pushing us into deeper waters. I was paddling with all my strength for the entire way back. I didn't take the camera out because the waves were breaking sometimes over the kayak hull, and salt water was splashing everywhere! Plus, if I stopped paddling for a second, I would start going backwards because of the wind. We took a break in the sheltered cove at Castle Tufa. Our faces were covered in white salty crust, and so were our arms! My hands looked like I had mickey mouse gloves on! Anyways, we eventually made it back to Navy Beach, where we had the baja parked. What a relief! But I had mixed feelings once we got there. At first I was really happy that we made it without any roll overs or other problems. And then I was like, "Is it over already!?" I wanted to keep exploring the lake, but I guess there's always next time, right?